1st thing that comes to ur mind is typical singaporeans. no other countries love how we behave. Sometimes I just hate it too! 1. 'Chope' seats with tissue especially during peak periods and no one dares to remove the tissue! 2. Complain all day long, BUT NO ACTION TAKEN. 5. Sees a long queue and join the queue w/o knowing whats happening. lol. other than typical singaporeans, have u wondered if singaporeans are patriotic? Would u like to take a quiz and find out what kind of Singaporean are you? Patriotic, or no? This website, "It's My Turn" (http://itsmyturn.sg/) is a simple online quiz that analyses your personality to find out "What kind of Singaporean you are?" There are different personalities and you see if it suits you! I've linked my facebook account w them! Here's what u will see when u click on their website to participate in the quiz! ok.. IT'S MY TURN to do the quiz!!!! One of the qns that was asked. I feel so 'singaporean' while attempting all the quiz. LOL. It's related to what is happening in our lives. There are 10 questions and Im done within 3minutes! hehe. so simple! Here's my results! Yeah totally agree that Im health-conscious, giving opinion whenever there's a need to and I need a chill pill! They have different questions and different results, go attempt and view yours now! u can participate in social initiative that can make a difference to people around you! You can create one! sounds so cool. There's a few that caught my eye! and also "Snack on fruits day" where we have to eat fruits instead of junk food to keep healthy! 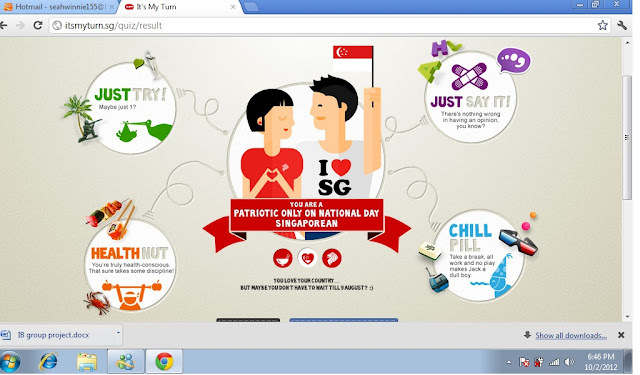 You can explore the website yourself, and be social active in Singapore.